Want to learn more about Miami Regionals? By completing this registration form, your name will be added to our mailing list. If you are interested in applying to Miami Regionals, we recommend exploring the resources on our website. Want to learn more about the admission counselors? The staff at Miami Regionals look forward to assisting you with your college search and admission process. We look forward to hearing from you! Ready to be a part of Miami Regionals? Just complete the application checklist that best describes where you are in your educational journey. How are E-Campus courses different from traditional classes? Online courses are conducted via the Internet. Hybrid courses blend online instruction with a traditional classroom experience. A typical hybrid course will meet on campus one time per week and the remainder of the content will be delivered online. Miami University offers a Bachelor Completion program in Electromechanical Engineering Technology concentration (EMET) to students at the following selected college partner locations via the Distance Learning Engineering Technology Program. Do I need to complete the standard admissions process to enroll in E-Campus courses? Yes. If you are interested in applying for a degree or you are a visiting student please visit Admissions for more details. Am I required to come to campus for an E-Campus online course? Miami University Regionals has divided courses into 3 categories: Online Courses, Hybrid Courses, & Traditional Courses. Online courses have no location-based delivery which means students are not required to come to campus for class. Students can complete these classes from almost anywhere with reliable internet connection. Hybrid courses usually have a component where students may be required to come to campus, usually no more than 50% of the class time. Traditional courses will require the student to come to campus. Who can take Online Course(s)? If you are a new student and have not yet applied to the Miami Regional Campuses, please visit Admissions. Online programs and courses are a good fit for just about any type of student: our valued Veterans, high school students, returning students, transfer students, and those changing career direction. 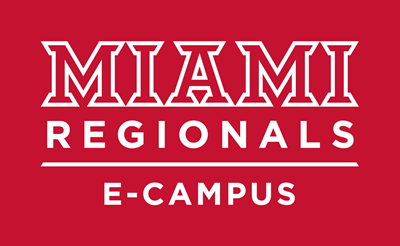 If you are already a student at Miami Regionals, you can schedule an online course at any time by going to One Stop. We also welcome students who want to pick up transfer credit in the summer or winter terms while remaining near their hometowns. Follow the link above to find out how. Can I take online classes or programs if I am not in Ohio? While Miami University is authorized to provide distance learning in many states, authorization to offer all online programs/courses/degrees is not practical because of the complexity and fluidity of requirements in some states, including differing requirements by academic program. Please check this website for the most updated information for your state or contact Regional E-Campus at 513-217-4003. State Authorization refers to state regulation of distance education courses and programs offered to residents of a particular state by an educational institution based in another state, as well as state regulation of various non-distance activities within a particular state by institutions outside of that state. State authorization requirements vary widely from state to state and change frequently. Do E-Campus courses cost the same as traditional courses? Online students are able to get the same quality experience at an affordable price. The Miami University Board of Trustees approved a fee of $35.00 per credit hour for all online and hybrid courses in addition to regionals tuition and fees. Can I use financial aid to pay for E-Campus courses? Yes, you can use financial aid to pay for E-Campus courses and programs. Visit the One Stop for Student Success for more information. What technology do I need to complete an E-Campus course? E-Campus courses may be completed using almost any computer running a recent version of any of the major web browsers. Mobile applications are available free of charge, for iOS and Android devices. Review the computer basic specifications for Canvas. Will I still need to buy a textbook? Each course has its own course requirements which may include: textbooks, software, and hardware. You can view the textbook requirements online at the Miami University Regionals bookstore. The bookstore can ship course materials to any location. Online courses are taught by distinguished and credentialed Miami faculty who love to teach and mentor students in traditional, hybrid, or online courses. What is the academic workload like in an E-Campus course? Online and hybrid courses are designed to be academically equivalent to traditional courses. Students often report spending more time on E-Campus courses because of the self-directed nature of the instruction. This increase in time is offset by the flexibility offered, especially in online courses. Will the instructor be available to their students during the course? Online courses still have an instructor that is available to students for questions and help. The course syllabus should list the contact information for the instructor. While taking an online course, instructors are available for students to contact through e-mail, phone or video conference. Are there other students in my online course? There are other students in your course but an interaction between the students will vary depending on the nature of the course. All online courses will have interaction between students, faculty, and the content to cultivate an online learning community. There is a ratio faculty to student ratio of 1:25 in an online classroom. Can I work at my own pace when I take an online course? Online courses vary in pace and deadlines, however, most courses will have weekly or bi-weekly deadlines for assignments, exams, discussions, group work or assignments. The syllabus and the course instructor will provide information on the course pacing and deadlines. What is the class schedule for an online course(s)? Miami University Regional Locations offer flexible scheduling options. During the Fall and Spring, we offer 14 weeks, 8 week, and 6-week courses. During the summer 6 and 8-week options are available. During the month of January, students can complete a course in 3 weeks. View the current schedule of online courses. Do online courses require less work than an on-campus course? No, expect to do a similar amount of work and spend the same amount of time on your online course as you would for a traditional course. Some research shows that online courses may require more work and time to complete. What time zone do I need to observe for course activities and deadlines? Unless otherwise stated, all course activities (discussions, tests, assignments, etc. ) are due by their stated due date and in Eastern Time (EST). Regardless of the time zone in which you are located, the classroom will record your submission in Eastern Time. The Eastern Time zone is the same time zone in which Miami University is located. For more information about time zones and which time zone you are located in, please visit timeanddate.com. How much technology knowledge do I need for an online course? All Miami University online courses utilize Canvas, the university learning management system to facilitate the course and learning interactions. It will be important for all online students to become familiar with Canvas. Here are some online tutorials that might be helpful: Canvas Student Guide. E-Campus - E-Campus (short for electronic learning) is an umbrella term that refers to all types of training, education and instruction that occurs on a digital medium, like a computer or mobile device. Online Course(s) - An instructional approach that does not require class attendance on campus. Students complete all learning and regular interactions (content, instructor, and peers) via a virtual classroom or web-based tools with minimal synchronous (live) requirements. Hybrid Course(s) - An instructional approach that includes a combination of online and in-person learning activities. The technology-delivered components include teaching and learning activities and reduces the time traditionally spent in the face-to-face classroom. Asynchronous Activities - A learning event where students engage in learning without the constraints of time or location to meet course deadlines. For example, use of digital repositories, on-demand videos/demonstrations, e-mail, discussion forums, independent projects, wikis/collaborative documents allow for students and faculty to collaborate and learn at independent times. Synchronous Activities - A learning event where students engage in learning at the same time, but not necessarily the same location. For example, use of instant messaging, live chat, webinars, virtual worlds and video conferencing allow for students and faculty to collaborate and learn in real time. Learning Management System (LMS) - A technology platform that is used to administer, document, track, and deliver course(s) and/or training programs.The platform includes tools to facilitate online learning such as discussion forums, quizzes, notifications, peer review, group work, gradebook, e-portfolio,etc. Mobile Learning - ﻿Learning that takes place on a hand-held device, such as a mobile phone or tablet, that can take place anytime and anywhere. Determine if Online is Right for Me? My Miami. My Future. My Way. Miami University Regionals' online programs are designed to offer students the richness of a premier education and the flexibility of learning at the location of their choice. Whether you are interested in a single course or an entire degree, we have a path to success for you.